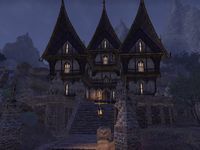 Serenity Falls Estate is a player manor in eastern Reaper's March. In addition to the house, the grounds include a large, two-story barn with stables on either side of it. The barn is separated from the house by a stream, fed by a waterfall and crossed via a bridge.